OptinMonster is a cloud-based solution for lead generation and marketing automation which allows users to create and A/B test a range of custom opt-in forms. With OptinMonster, users can build a range of form types, including slide-ins, floating bars, inline forms, scroll boxes, lightbox popups, slide-ins, and more. The drag-and-drop form builder allows users to customize form branding, including messages, images, and colors, without requiring any coding. Built-in page-level targeting enables the display of unique campaigns or offers based on the location and behavior of visitors, allowing users to segment their email list based on subscribers’ interests and website interactions. Different form variations can be A/B tested to identify the version with the highest conversion rate, with users able to change the form headline, content, style, layout, and opt-in trigger. OptinMonster automatically replicates the existing opt-in form being tested for users to make changes to, then randomly serves up each variation to visitors and tracks impressions, conversions, and landing pages for each option. OptinMonster also includes Exit-Intent® Technology, which automatically tracks visitor behavior, identifies when they are about to navigate away from the site, and serves up targeted campaigns as they are about to leave. The system is designed to reduce cart abandonment and increase conversions. Campaigns can include invitations to chat with support agents, special offers or discounts, incentivised email list signups, and more. Optinmonster makes it very easy to put beautiful forms on your website and pop them when, where, and how you need them on your websites. They integrate with email marketing software platforms easily, and there is always Zapier if they don't happen to be integrated with the platform you use. I have been a customer for 3+ years, and despite the fact that I can better design forms, I still prefer to use them for my customer optin information collection. The many different ways you can have a form display on your website keep me as a customer.I started using Optinmonster because I couldn't design a good looking form and I couldn't get it to open / pop when I wanted it to. I needed something that looked better than what I could get from my email marketing software and I needed to make it appear when and how I wanted it to. This is easily accomplished with Optinmonster! I started using Optinmonster because I couldn't design a good looking form and I couldn't get it to open / pop when I wanted it to. I needed something that looked better than what I could get from my email marketing software and I needed to make it appear when and how I wanted it to. This is easily accomplished with Optinmonster! They don't update their form designs very often and if you want to have the same form used on different pages or in different ways (on click vs exit intent) then you have to design a new form and set it up for each individual interaction scenario you need. OptinMonster is a great lead gen tool for exit intent, slide-in CTA, lightbox popups, etc. The user interface and building a popup took me a little while but once I got the hang of it, not so bad. Also, whenever I've had questions or needed help their support team responded very quickly. The biggest drawback is their templates are not very customizable. You can change colors of buttons and background colors and insert your own image but the templates I tried, the platform doesn't allow you move things around to get the pixel-perfect design I want. For example, inserting an image was locked into place basically without being able to crop it if necessary or move it closer or further away from other elements. Other competing software does offer that capability. What I like most about this software is that you can easily integrate and make edits to your site's pop ups. We have a pop up that I've set to appear 30 seconds after you land on our homepage. It's opts customers to sign up for our email newsletter (the incentive is that they will be entered into our monthly giveaway). The list of emails goes straight to our email marketing tool so I can easily pick a winner every month. I also have an exit intent pop up that appears whenever you are on certain pages of our site and move your mouse to close out. It's very easy to edit this pop up as I often make changes to it. My experience with OptinMonster has been great. I'm really glad they have an option to A/B test pop ups. Very happy I chose OptinMonster!Integration was super easy. It's also very easy to edit currently running pop ups (no need to have a developer push anything new to code- simply log in to optinmonster's website, swap out an image or change some text and watch it update on your website in real time). They have exit intent pop ups which we utilize (and you can choose what pages on your site you want certain ones to show up on). There's analytics built in so you can see how your pop ups are doing. You can A/B test. They do it all! Integration was super easy. It's also very easy to edit currently running pop ups (no need to have a developer push anything new to code- simply log in to optinmonster's website, swap out an image or change some text and watch it update on your website in real time). They have exit intent pop ups which we utilize (and you can choose what pages on your site you want certain ones to show up on). There's analytics built in so you can see how your pop ups are doing. You can A/B test. They do it all! Can't have unique promo codes generate. For instance, I can't have a unique promo code pop up for every customer. We have an exit intent cart saver pop up that gives customers a 5% off coupon code. I have to monitor the coupon websites around the web such as "retail me not" to make sure the promo code doesn't show up on there (it always does). Then I have to go and change the promo code. If OptinMonster had the option for unique promo codes this wouldn't happen. OptinMonster is super easy to use and works extremely well. I've used it for 3+ years and the functionality has gotten even better since I started. It's hard to write cons for OptinMonster. The price is right. It's simple to use. It runs really quickly. And when I have a support question, they answer it expertly and really quickly. Impressed with the product, I can see the value it would add to higher traffic websites. As an earlier stage venture, it was probably overspec for my needs.Slick, advanced technology for pop-up opt-in forms. Easy to create good-looking, smart forms with really impressive functionality. Exit intent is the most technologically impressive, but I thought the sidebar and embedded forms were the most practical. Great that it plugs into email marketing software like MailChimp and the like, avoids the need for using Zapier or a more manual workaround. The form creation menus were mostly self explanatory and straightforward. Slick, advanced technology for pop-up opt-in forms. Easy to create good-looking, smart forms with really impressive functionality. Exit intent is the most technologically impressive, but I thought the sidebar and embedded forms were the most practical. Great that it plugs into email marketing software like MailChimp and the like, avoids the need for using Zapier or a more manual workaround. The form creation menus were mostly self explanatory and straightforward. I'm likely an anomaly, but I had trouble getting it to work consistently with the website builder I use (Strikingly). The pop-ups usually worked, but the embedded forms often didn't load. I'm still impressed with the technology, but it's worth thoroughly testing that the opt-ins work correctly on your website before committing, especially if you intend to buy one of the more expensive plans. A range of opt-in form types can be created with the drag-and-drop form builder, including floating bars, lightbox popups, sidebar forms, and slide-ins. Exit-Intent® Technology automatically identifies users who are about to leave based on their behavior, and serves a targeted campaign as they go to navigate away from the page. Different form designs, content, headlines, and more can be A/B tested to determine which variation has the highest conversion rate. Different forms can be displayed on specific categories or pages to create an email list with highly targeted segments. Built-in analytics and integration with Google Analytics give users an overview of views, clicks, conversion rates, referral pages, and more. Below are some frequently asked questions for OptinMonster. Q. What type of pricing plans does OptinMonster offer? Q. Who are the typical users of OptinMonster? Q. What languages does OptinMonster support? Q. Does OptinMonster support mobile devices? Q. Does OptinMonster offer an API? No, OptinMonster does not have an API available. Q. What other apps does OptinMonster integrate with? Q. 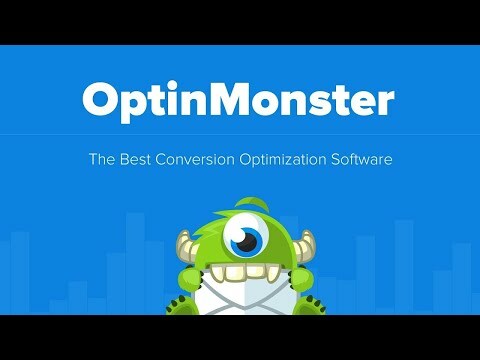 What level of support does OptinMonster offer?